Present state: Demolished - nothing remains of the station although some piles from the pier are visible at low tide. Notes: The extension from Sharnal Street to Port Victoria opened on 11.9.8982. 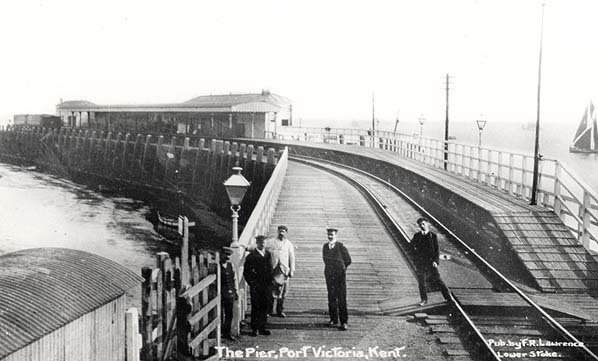 Port Victoria station was located on a wooden pier in the River Medway Estuary. When the pier was declared unsafe in 1931 the station was closed and shortly afterwards demolished. A new temporary wooden platform was built close to the landward side of the pier. This was later replaced by a concrete platform; there was also a new brick signalbox. The station was finally closed in 1951 when an expansion of the oil refinery required the land. All evidence of the station was swept away but at low tide it is still possible to see some of the piles from the pier. There is no public access to the site. Alongside the station the single storey weather boarded Port Victoria Hotel was intended as a temporary construction but when passenger traffic on the line failed to live up to expectations, the building was never replaced and was finally demolished in 1952. The 1901 census records an unregistered hulk 'Gannet', moored off Port Victoria pier, being used as accommodation for S E C R Co. employees. On the night of the census it housed the station master, his clerk and 18 porters. 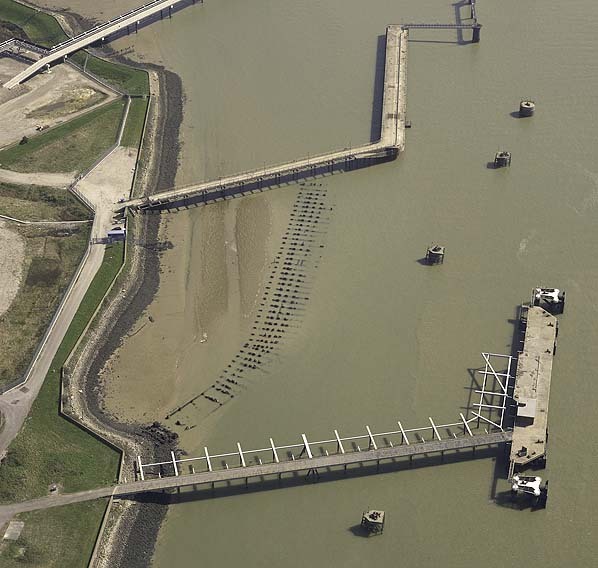 In 1865 the North Kent Extension Railway was granted authority to build a line from the SER track at Gravesend across the marshes to a pier on the west bank of the Medway opposite Sheerness. However since neither of the rival companies, the LCDR nor the SER, liked the idea, it failed to materialise. for a line from Gravesend to the Medway and to achieve this end, they instigated a supposedly independent company called the Hundred of Hoo Railway Company. As the route from Charing Cross to Port Victoria (as it was to be called) was 40 miles compared to the LCDR's 52 mile route to Queenborough, the SER were convinced the route would be successful. Parliamentary Acts were granted by 1880 and construction work started shortly afterwards. A further Act in 1881 passed the line over to the SER. On April 1st 1882, the first section from Hoo Junction to Sharnal Street was opened with the remaining section to Port Victoria opening on September 11th 1882 by which time a wooden pier and a modest weather-boarded Port Victoria Hotel had been provided. It was soon clear that the new rout was not as popular as predicted due to the new docks that opened at Tilbury in 1886. The line was however used by the Royal Family. mainly by workmen's traffic. Three further halts were also provided on the main line at Milton Road, Denton and Milton Range. The halts were all of timber construction but were later rebuilt in prefabricated concrete. Milton Road was short lived and closed during WW1 as an economy measure. It had never been popular due to its close proximity to Gravesend Central and it never reopened. By 1916 the pier at Port Victoria was declared unsafe and the seaward portion was barricaded off. Passenger traffic continued to dwindle after the First World War but at the same time freight traffic was developing with the opening of the Medway Oil and Storage (later Power Petroleum Company) Company's new depot at Grain in 1928. The pier continued to deteriorate and by 1931 no trains were allowed onto it and a temporary wooden platform was built at the landward end while a basic concrete platform was completed on safer ground. iisland platform with a run-round loop plus carriage and goods sidings. Still hopeful, the Southern Railway maintained its confidence in the lines future with a second platform being added at Cliffe and Sharnal Street and the branch to Allhallows was doubled in 1935. With the opening of the branch to Allhallows, passenger traffic to Port Victoria dwindled to almost nothing with only two trains a day, principally for the benefit of the workers at the petrol depot. The popularity of Allhallows was improving by the late 1930's and the Southern Railway considered doubling the whole line. The proposal was put on hold on the outbreak of war in 1939 and was eventually abandoned. During the war the line was well used with the oil terminal being adapted as the base for PLUTO (Pipeline under the Ocean) supplying the allied forces in Europe. long single island platform and a large brick signal box and was intended primarily for the use of workmen at the oil terminal. Due to the increase of freight traffic there were rumours that the whole line was to be electrified but the post war popularity of the motor car led to a continued decline in passenger numbers. The resort of Allhallows did not continue to develop and despite all efforts, attempts to sell housing plots remained unsuccessful and before long the railway authorities accepted defeat and reverted to a limited local service. As the traffic continued to deteriorate the line went back to single track in 1957. 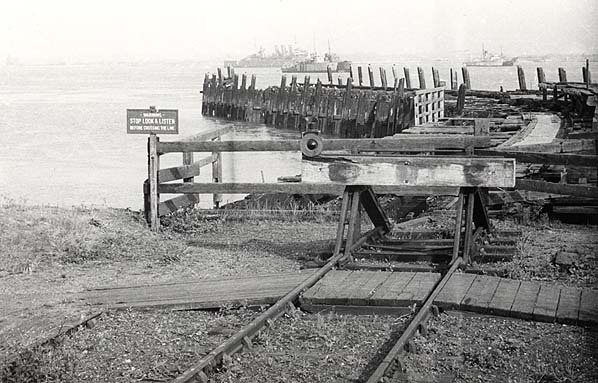 The situation lingered on until 1961 when the passenger services from Hoo Junction on the Gravesend line to Grain and the branch to Allhallows were withdrawn on December 4th. The wooden station buildings at Cliffe and Sharnal Street were demolished in 1966 and the signal box at Cliff was demolished in 1973. In 1974 a campaign was instigated by Stoke Parish Council to have the railway reopened to passenger traffic but British Rail opposed the proposal as the line was only single traffic and because of the signaling complications in introducing a passenger service onto the busy freight line. 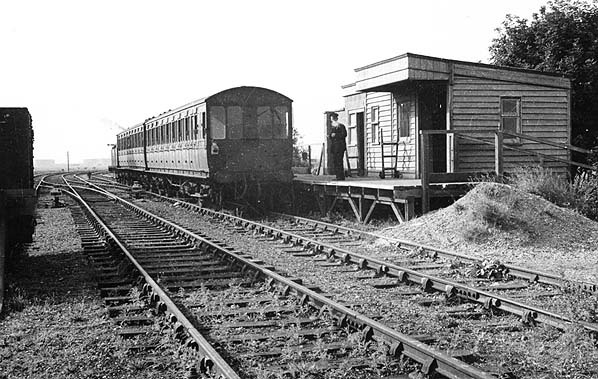 Stoke Junction Halt, Grain Crossing Halt, Grain & Allhallows-on-Sea.